You probably read many classic novels in high school and college. Pride & Prejudice by Jane Austen, The Catcher in the Rye by JD Salinger, Great Expectations by Charles Dickens, 1984 by George Orwell…the list goes on. These books are so well known, as are the writers who created them. 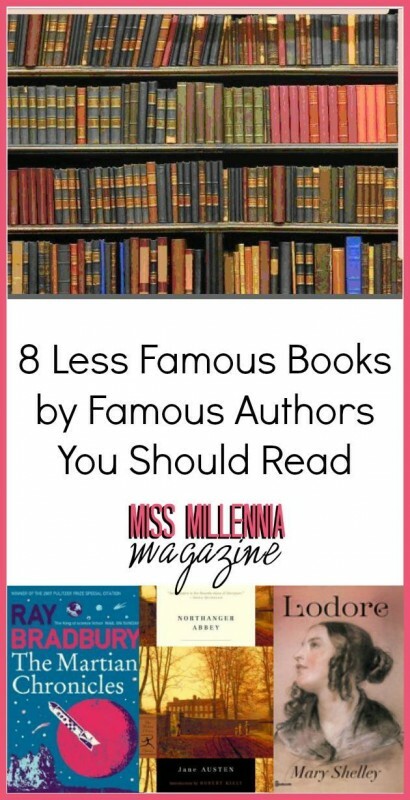 But these aren’t the only books these authors ever wrote. What about their less popular works? All of these authors are very talented; they’re not one-trick ponies! So, to give some exposure to their lesser-known works, here are eight less famous books by classic authors you totally need to read! I am a huge Jane Austen fan. I have read almost all of her published work, including short stories and unfinished novels. Besides Pride & Prejudice and Emma, which I would say are her two most famous works, Northanger Abbey is my favorite. All the bits of satire and sass that Jane Austen brings to her writing are fully unleashed in Northanger. The book is about Catherine, a 17-year-old Gothic novel fan. She is invited to go to Bath with her wealthy neighbors, and while she is there she meets many charismatic people. This coming-of-age tale is all about learning how to believe in yourself and figuring out who else is worthy of trust. The Catcher in the Rye is my #1 favorite book of all time. So when I heard that JD Salinger has other published work, I immediately read all of it. While Catcher is his only novel, Salinger has written many shorter works of fiction. My favorite collection is Franny and Zooey, a pair of stories about the two youngest members of the Glass family. “Franny” is a short story that takes place during a date between Franny and her boyfriend Lane. It mainly addresses themes of disenchantment. Zooey, a novella, is about Franny’s unstable emotional state and her older brother Zooey’s attempt to comfort her. I’m always impressed with Salinger’s ability to capture the young adult experience, especially in Franny and Zooey. Shirley is Charlotte Brontë’s second published novel. She finished writing it after the death of three siblings in eight months, and her emotional turmoil comes through on the page. Shirley is an independent young woman who is the sole heir to her family’s fortune. She is business-minded and seeks to use her money for the benefit of others. Shirley befriends Caroline and Robert, who are close friends, and adventures ensue. If you think that classic books have boring plots, check out this one. It has plenty of action. Since Mary Shelley is the daughter of famous feminist Marry Wollstonecraft, it’s no surprise that she was instrumental in the emergence of female authors. In addition to creating one of the most famous monsters in history, she was a prolific writer of short stories, essays, and travel logs. Her novel Lodore investigates women’s role in the strict hierarchy of a patriarchal society. The plot focuses on a mother and daughter pair as they navigate the world after Lorde Lodore’s (husband and father) death. Both women must learn how to gain independence after being conditioned to depend on the male head of the house. This book is a collection of fairy tales by Oscar Wilde. This not-so-secretly gay, Irish writer was fearless in his writing. Wilde’s fairy tales are unlike any others you have read before. This collection contains five stories, my favorite of which is “The Devoted Friend.” It’s about Hans, a gardener who was manipulated by his friend. A bird tells this story to a rat, and the rat becomes angry that the tale has a moral at the end. Very meta. While these stories are meant for children, the stories are morally and intellectually complex. This mid-20th-century science fiction writer only wrote one novel, but also created many short stories and contributed to movie and TV scripts. The Martial Chronicles is a collection of short stories about the human colonization of Mars. The events take place after the destitution of Earth by atomic weapons. All of these stories were originally published in science fiction magazines in the 40s and later woven together. If you’re a fan of dystopian fiction, this collection is a must-read. Virginia Woolf is known for many of her works, but as a prolific writer, she certainly has many more that aren’t as famous. Night and Day is a novel about two acquaintances, Mary and Katharine, who each navigate complicated romantic lives. Mary works in an office that supports woman’s suffrage and falls madly in love with a man. Katharine is a high-class woman with a secret love of astronomy who is engaged to an impressive man. Both women have rocky romantic relationships, and neither end up where they expected. Virginia Woolf is known for her attention to the intricacies of romance, and that definitely shows through in Night and Day. I’m willing to place a bet that every high school graduate in the United States has read The Great Gatsby. I’d also bet that most of those students have never even heard of Fitzgerald’s other works. Though it’s difficult to top the genius of Gatsby, Fitzgerald delivers another great story with This Side of Paradise. This novel is about Amory Blaine, a student at Princeton University, who has a fleeting romantic connection with Isabelle Borgé, a girl from his Midwestern hometown. The main themes of greed, love, and corruption are similar to Gatsby, but told in a completely different way. Make sure to add these quality books to your to-read list! Even though they’re not as famous as the authors that wrote them, they’re still fantastic reads. Previous Post: « The Perfect Haircare Products For Me: Finally!